FLORENCE – The day he turned 17, Adolfo “Harpo” Celaya enlisted in the U.S. Navy. Celaya said the fliers made it seem fun. 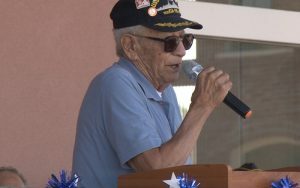 Celaya was aboard the USS Indianapolis, a flagship of the 5th Fleet, during World War II. On Sept. 16, the U.S. Postal Service building in Florence was dedicated to Ceyala, now 90. The USS Indianapolis is known for delivering the world’s first operational atomic bomb on July 26, 1945. Several days after that, a Japanese submarine fired two torpedoes that hit the USS Indianapolis. Celaya woke up to the boat on fire. The boat sank in 12 minutes. Celaya was among the survivors who spent four days and five nights in the water before they were rescued. When Celaya returned to the United States, he re-enrolled in school and played on the Florence High School’s basketball team. “It helped me a lot to come back to school” he said, because it helped with his Post Traumatic Stress Disorder. 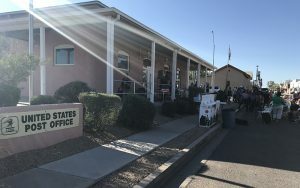 To name the post office after Celaya, Arizona Congressman Paul Gosar, R-Prescott, had to get Congress to pass a bill. At the dedication event, Gosar thanked Celaya for the sacrifices he made. “Harpo Celaya is a true hero beloved by his hometown, right here in Florence,” Gosar said. Michael K. Quintana, the Florence postmaster, said he is proud that he got to help celebrate Celaya. “It was an honor for us to be able to honor Mr. Celaya in this way,” Quintana said. Celaya said he was happy to be recognized by his hometown and even happier that his family made the event.